I'm so grateful for Designer Series Paper at this time of year! It makes creating effective and individual Christmas cards (yes - I know I'm crazy but I like to give everyone a different card!) a snap! This trio of singing (or caterwalling?) 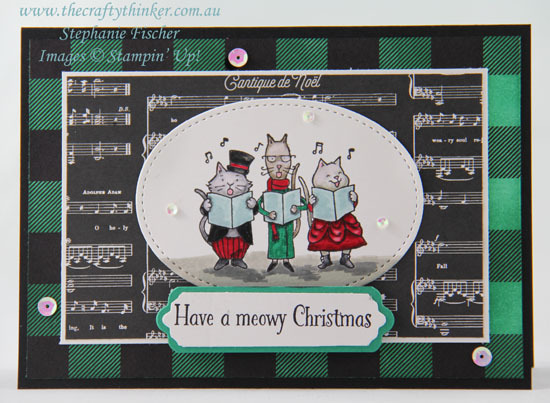 cats really appealed to me in the Santa Paws stamp set and it was so much fun to colour the image with the Stampin' Write Markers before I cut it out with an oval Stitched Shapes die. Having sponged a piece of black and white checked paper from the Merry Little Christmas Designer Series Paper pack with Emerald Envy ink, I layered it onto my Basic Black card followed by layers of Whisper White and Merry Music Designer Series Paper. I trimmed the ends of the sentiment and its Emerald Envy mat with Lots of Labels dies and added it to the card with dimensionals. Last, but not least, I added some of the gorgeous opalescent sequins in a variety of sizes from the Metallic Sequins Assortment.